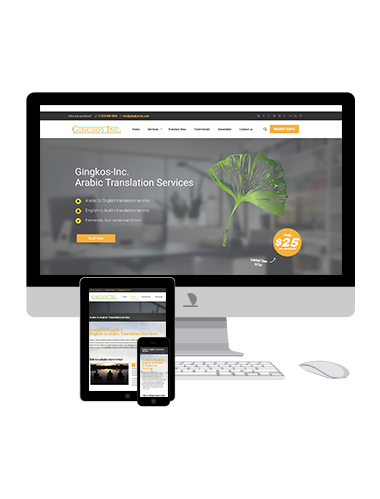 Arabic & English Website Localization | Gingkos-Inc. Without website localization, your outreach might be severely undermined and missed. We're one of the most trusted Arabic translation companies. 100% on-time and on budget! Our projects are always performed by a native speaker of the target language. Our tech support is available 24/7. We are here to assist you in any way we can! Meeting style guidelines and meeting industry expectations. We are one of the best around! There are millions and millions of websites on the internet, all competing to reach an audience that is increasingly bombarded with information. Due to this information onslaught, it is vital for websites to go the extra mile in attracting and maintaining an audience. One major way of accomplishing this is to ensure that your website is available in different major languages. As one of the six official UN language, Arabic is one of the world’s major languages. It therefore makes business and strategic sense to translate your website into Arabic or Arabic into English. This where we come in, since Arabic Website Translation is one of the strongest areas of our expertise. With our extensive experience and great connections, we're qualified to take care of all of your translation needs. From website localization to business interpretation, our network of professional translators, interpreters, copywriters, proofreaders and researchers will deliver quick and accurate translations, at a reasonable price. Watch our 3 minute video! We are currently updating our web commercial. Please check back at a later time or sign-up to our newsletter for news and information..